SKI IN / SKI OUT CUSTOM HOME. This is a one of a kind gem situated on the Stagecoach run in Heavenly Valley. It is only single family ski in/ ski out, in Tahoe Village!. Heavenly Valley is the largest ski resort in North America. Stagecoach (intermediate run) is the best access point to Double diamond runs such as Mott's, Milkyway, North Bowl and many others. Others advertise Ski in/Ski out, but no others are closer than we are. Our front door is 25' from the run. Truly an incredible location for those diehard mountain enthusiasts! We purchased the Lodge in August of 2010 and have remodeled and refurnished. We handle all bookings, as well as arrivals and departures ourselves and will strive to make your stay 100% enjoyable and look forward to your return trips. The Lodge has wonderful views of the lift, Carson Valley and of course the mountain and ski areas. Since we are located on the main lift, the roads are kept clear and typically do not present any problems. The Lodge itself is 3 levels and has beam ceilings, oak floors, rock walls, 2 gas fireplace stoves, a great room encompassing the kitchen, living room and formal dining table that comfortably seats 16. A spacious enclosed sunroom featuring incredible views and comfortable massaging recliners. The family room has cedar lined walls a wonderful Brunswick pool table, large screen TV, a 20' long cedar bar that has a sink, and refer. The bedrooms all have views and are nicely furnished for your comfort. 1st level bedrooms share a bathroom through one of the bedrooms. 2 bedroom, kitchen, bath detached unit over garage sleeps additional 4 if required for additional fee of $150.00 per night (see vrbo #316731). We appreciate your having looked at our site and hope to be of service to you. Heck with me! Have a look at the virtual tour. You need to see it to believe it! There is nothing else like this home on the entire mountain. Judge for yourself and see. Need to feel it to believe it! A one of a kind property in the best location for those with the best taste. Bathroom #5 is in the guest house if rented with the main house only. 2 cars can be parked at the lot next door to the house. At the clubhouse on Tramway. See the local HOA channel on TV for access code. 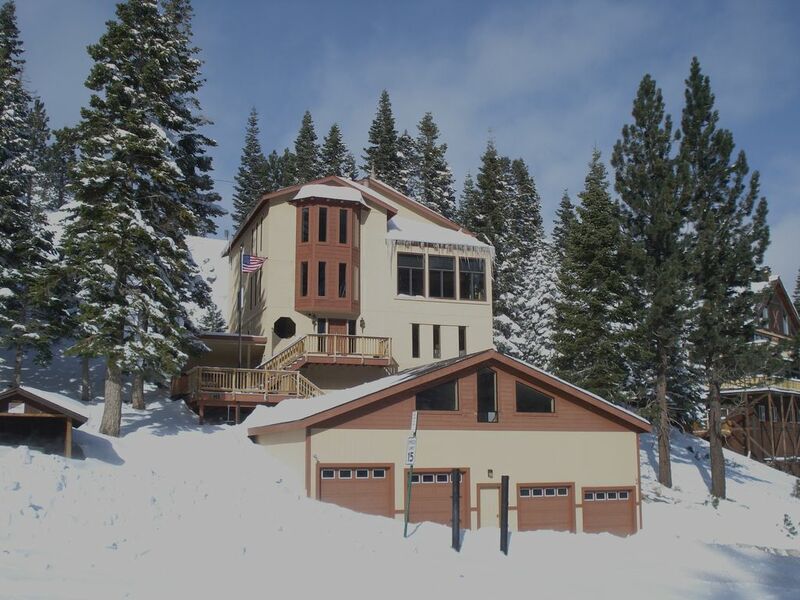 This property sets on the trail head of the world renowned Tahoe Rim Trail and on the Nevada side of Heavenly Valley, one of North Americas biggest ski resorts.